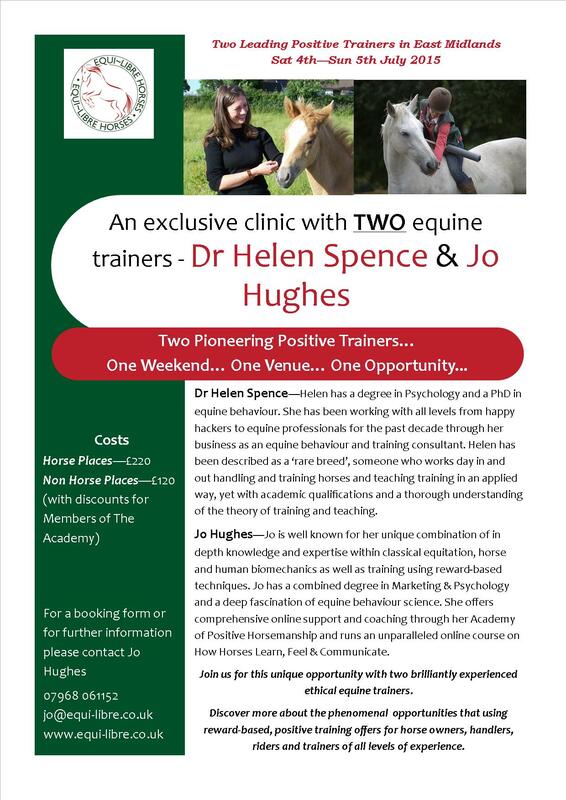 Bookings are now open for this clinic with Helen Spence and I on 4th & 5th July. Helen is one of the very few trainers that I personally recommend and would happily hand my own horses over to. She is a fabulously empathic trainer with both humans and horses. I am honoured to have been personally mentored by her. Dr Helen Spence has a degree in Psychology and a doctorate on ‘The Influence of Owner Personality and Attitudes on the Behaviour and Temperament of the Domestic Hors…e’. She runs her own consultancy business offering advice on horse behaviour and on training and rehabilitation issues faced by horse owners, including riding lessons. She also designs and delivers regular educational talks, workshops, clinics and demonstrations for horse owners and riders and for all types of equine professionals, including other pet behaviour therapists, and offers mentoring and training support for professional equine behaviourists and trainers. She travels all across the UK and Ireland to teach and has even been as far afield as Finland. She has taught Psychology at undergraduate level and was a tutor on the MSc in Companion Animal Behaviour Counselling at Southampton University, delivering the Equine Case Studies and Equine Welfare/ Ethology lectures. She has recently been invited to teach similar content on the MSc in Clinical Animal Behaviour for Waikato University, New Zealand. She lectures on Equine Behaviour and Practical Handling as part of the Optional Behaviour Weekend at University of Liverpool School of Veterinary Science run by highly respected veterinary behaviourist, Sarah Heath. On a personal level, she has an interest in classical riding and is passionate about teaching riders the correct classical seat, heavily influenced by Alexander teacher and classical instructor Gloria Pullan who herself trained with two former pupils of the Spanish Riding School of Vienna, Charles Harris and Daniel Pevsner. She has been described as a ‘rare breed’, someone who works day in and out handling and training horses and teaching training in an applied way, yet with academic qualifications and a thorough understanding of the theory of training and teaching. Places are going to sell out on this really fast, so drop me an email to jo@equi-libre.co.uk for a booking form.